Once again your skills leave me in awe. These two little people are so cute. Very cute and tasty bento. @Marisa Lyn : Thanks a lot Marisa! Hope can join your twitter party on previous day..
Oh my gosh, these are so ADORABLE!! Oh, and pop by today for my perfume GIVEAWAY! So exquisite! Really don't know how you manage such intricate cutwork so early. Even if I'm fully awake it's a challenge! Happy Girl's Day!! @Jen : Thanks a lot Jen! Wow, that's a real artwork! I am impressed!! Very neatly and beautifully done as usual, Lia:). Oh my gosh Lia, they are so perfect! 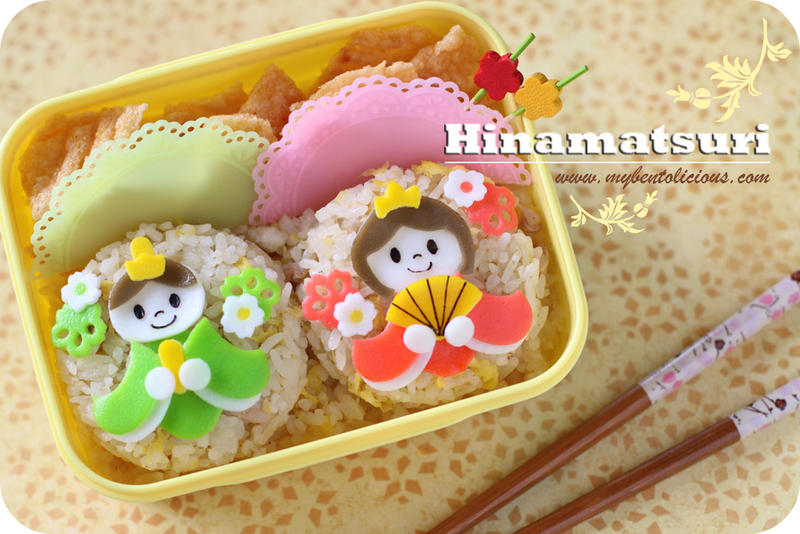 What a beautiful Hinamatsuri bento! Happy Girl's Day, Lia! This vivid bento celebrates the day with great charm and style. As always your creative details leave me in ahhhhs! You are so talented to make this with "blank" mind! They are super cute ^_^! @gerandis : Thanks a lot Gerandis for your kind comment! LIAAAAAAAA!!!!!! !Awwww.....what an adorable bento :D :D :D you're so expert in this egg-sheet stuffs.. I loooovee this hinamatsuri theme. This is sooo adorable! you went from "Blank" to this cute bento.. really amazing.